In December 2007, the Palestinian National Authority (PA), in close consultation with donor states and institutions like the International Monetary Fund (IMF) and World Bank, proposed the Palestinian Reform and Development Plan (PRDP), a program based on “rebuilding the Palestinian national institutions” and “developing the Palestinian public and private sectors.” To augment this plan, the PA further presented in August of 2009 a program titled Palestine: Ending the Occupation, Establishing the State, this latter program was much more explicit about a time frame for the declaration of a Palestinian state. Salam Fayyad, current unelected PA Prime Minister and former World Bank employee, put forward this document (henceforth the Fayyad Plan) insisting that, despite the occupation, Palestinians need to be building the “infrastructure for a future state.” The report calls upon “our people, including all political parties and civil society, to realize this fundamental objective and unite behind the state-building agenda over the next two years.” Fayyad’s intention is to unilaterally declare a Palestinian state in 2011 based on the June 4, 1967 borders. Essentially, Fayyad’s PA must follow the dictates of the World Bank and Western powers to assure access to funds and, so far, they seem extremely willing to do so. The boycott of Hamas by Western powers (the Canadian state being the first to cut aid) and the siege on Gaza serve as an example to the West Bank PA leadership of what would await them if they stray from this model of state-building. Understanding the logic of the Fayyad Plan is critical to assessing the current state of the Palestinian struggle. Often the analytical emphasis is placed on Israeli action, while internal Palestinian politics are ignored. However, the shifts taking place within the Palestinian Occupied Territories such as the increased power of a Palestinian elite class, and the hand-picking of Fayyad to implement neoliberal reforms, are vital to understand because they pose significant obstacles to Palestinian prospects for self-determination. Palestine: Ending the Occupation, Establishing the State is a 54 page report explaining Fayyad’s vision, peppered with every World Bank catch-phrase imaginable from “institution-building” to “efficiency” leading all the way to “human development.” Once the various layers of rhetoric are cleared, the basic idea is to have a fully functioning, neoliberal state apparatus in place before a Palestinian state is declared. Fayyad’s program completely adheres to the World Bank paradigm of fiscal austerity, open markets for foreign investment and an emphasis on export-led development. The neoliberal vision espoused by Fayyad works in tandem with the Israeli government’s plans for Palestinians and integrates the Occupation in the planning for a future Palestinian state. It was Netanyahu who announced in 2008 his intention to “weave an economic peace alongside the political process which will give a stake in peace for the moderate elements in the Palestinian society.” This “economic peace” is one that guarantees security and access to Palestinian markets to Israel – without the need to take any responsibility for the population. The Fayyad Plan has gained tremendous support from the Western powers. Shortly after the plan’s publication the Obama Administration announced a $20-million grant to back the effort. Congress approved a $200-million deposit into the PA treasury. Since the treasury falls under Fayyad’s direct control he now has effective control over the West Bank economy and the political process. It is increasingly evident he is being groomed to take over from PA President Mahmoud Abbas. This of course begs the simple question: a state over what territories? With the continued building of settlements, with the apartheid wall and its network of Israeli-only roads – all that is left are Palestinian Bantustans. Fayyad’s plan does envision development in areas of the West Bank that Israel fully controls: how this will be achieved without Israeli approval is not explained. But, for the sake of argument, let us suspend the reality on the ground, pretend that there isn’t an occupation, and analyze the logic of this Fayyad PA vision. The Palestinian economy has been devastated by the continued Israeli occupation. Israeli control over borders and restriction on movement means that a viable Palestinian economy cannot grow. Israel has also worked diligently to replace Palestinian labour in its own markets with migrant labour so it could sever any reliance on Palestinian workers (as strikes were an effective form of resistance in the first Intifada). The PA, as it emerged after the Oslo Accords in 1994, was not designed to achieve economic independence from Israel by any means; rather, the agreements cemented Israeli control over the West Bank. In the 1994 Paris Protocol, for example, an economic agreement signed between the Palestinian Authority and the Israeli government, the PA agreed to cede ultimate control over imports and exports to Israel. After the election of Hamas and the cutting of aid from donor countries – it became glaringly apparent that as an entity the PA is fully reliant on outside funding for its survival. Any talk of economic development for the West Bank that enables Palestinians to survive the reality of Israeli closures and to become self-reliant in order to sustain the resistance and remain on the land, would be more than welcome. However, the Fayyad Plan has nothing to do with developing a sustainable Palestinian economy. The economic development model put forward in his program is a normalization model reliant upon persuading Israel and the international community that Palestinians could be both good trade partners and cheap labour. More specifically, the Fayyad’s Plan is designed to cut-back public-sector spending on welfare and social needs, while simultaneously strengthening the security apparatus of the PA. One need only look at the economic reforms Fayyad’s PA has implemented thus far. Another ‘reform’ is to “institute measures to increase collection of electricity bills from users and to continue to distribute at least 20,000 pre-paid electricity meters and reduce net lending to 6 percent of GDP.” This shift is designed to force a population – already impoverished due to the occupation – to live without electricity if they do not pay their bills. It is worth noting that the West Bank depends on the Israeli Electric Company (IEC) to supply the majority of its power through three substations located in the Ariel settlement, the Atarot industrial settlement and the area C region near Hebron. Essentially, the PA is collecting the bills for the Israeli company. The fact that the power stations are also located inside illegal settlements, means that the program is de facto accepting that settlements will exist in the future Palestinian state. The PA has also introduced pension reform, where they will adopt “an action plan to reduce PA short term pension liabilities and begin to implement the plan by including measures in the 2010 budget that will reduce PA pension liabilities and put the PA pension schemes gradually back on a path to ensure their financial sustainability.” This measure is designed to reduce the pensions they are paying out to people who used to work for the Palestinian Liberation Organization and the Palestinian Authority. Not only does this have a financial impact, but an accompanying political aim. The Fayyad government is forcing many members of the different factions (mainly Fatah with the largest share of PA jobs) to take their pensions in lump sums and leave their current posts. This is a political cleansing of the old guard of Fatah from the public sector, to be replaced by a younger generation of technocrats more in tune with World Bank standards. The neoliberal program that the PA is pursuing thus promises severe cut backs to the social provisions of the authority. But, as with similar neoliberal programs around the world, this should not be interpreted as a cutback to the state itself. Concurrent with the slashing of social spending, the budget for the repressive arm of the state is skyrocketing. As the donors poured money into Fayyad’s plan, $109-million was committed in 2009 to finance an expanded training program for the PA security forces. These security forces have been under Fayyad’s control since 2005, supervised by U.S. Lt.-Gen. Keith Dayton. To make the point that what’s being created is by no means an independent security force for a future sovereign state, all the new personnel are vetted by the Israeli secret security apparatus, the Shin Bet, before being able to join the force. According to the World Bank report, of the 2,790 increase in employment in the Palestinian Authority in 2009, there was a 1,325 increase in members of the security forces. In other words, nearly half of the number of jobs created in the Palestinian Authority were in the security sector. Over the same period of time, the Ministry of Health lost 94 workers. There have been numerous reports of full security cooperation between the Israeli military and Fayyad’s Dayton-trained forces. Recently, when there were calls for demonstrations in the West Bank against settlement activities in Jerusalem, the PA police warned that no demonstrations would be allowed without permits. The idea of a population under occupation seeking permits from its own (non-elected) authorities to demonstrate against the occupiers speaks volumes to the nature and function of the PA. The main security challenge Dayton boasts about in his speech though is Operation Cast Lead, Israel’s brutal war against the population in Gaza. Hamas had called for ‘days of rage’ across the West Bank during the war, but “the professionalism and competence of the new security forces guaranteed a measured and disciplined approach. They allowed demonstrations but prevented them from becoming violent, keeping the protesters away from Israelis.” Dayton continues that “the IDF even felt comfortable enough to deploy major units away from the West Bank in order to help in Gaza.” Dayton, was frank when speaking to the Washington Institute for Near East Policy, that it is an international team leading the effort to build these security forces. He explained that “its ongoing work in the Israeli-Palestinian arena has been shaped by significant contributions from Canada, the United Kingdom, and Turkey.” The Canadian role, in particular, is disturbing, aside from recently shifting aid from the United Nations Relief and Works Agency (UNRWA) to the Palestinian Authority for the purpose of strengthening the PA position, according to Dayton “the Canadian contingent – which includes highly proficient Arabic linguists – travels about the West Bank freely” and their work is invaluable to the mission. From its side, Israel has completed construction of six commercial crossings between Israel and the West Bank. Almost all Palestinian commercial goods are required to be shipped through these crossings using a ‘back-to-back system.’ The World Bank goes on to say that “cooperation between the Government of Israel and the PA is critical in order for the PA to establish a presence at the borders of the West Bank and Gaza to ensure that it captures a high proportion of what is owed in value added tax and import duties.” Part of increasing ‘fiscal sustainability,’ according to the report, is the PA’s ability to collect domestic tax revenues for the future Palestinian state. The absurdity of the situation becomes even clearer. The World Bank continues on to say that the “PA is currently moving to establish a competent border management system that can be put in place at the commercial crossings and the borders of the future state.” The PA has even formed a border management authority. As a dependent economy, the Palestinian Authority will be reliant on imports from Israel in order to sustain itself. The role of the PA will not be to control its borders, but to ‘manage’ them. At the same time – because once a state is declared and ‘peace’ is achieved, normal trade relations would commence between Israel, the PA and the rest of the Arab World – the PA-controlled West Bank state becomes an entry point for Israeli goods into the rest of the Arab world. In this way, the Fayyad Plan is nothing but a normalization mechanism, that evades the political and social conditions of the Occupation. It is a preparatory stage for establishing proper trade routes between Israel and the rest of the Arab world. Money has been dedicated to this project and ‘moderate’ Palestinians have been chosen in order to achieve this goal. While Israel has spoken out against unilateral declaration of a state, they, too, are happy to see an ‘economic peace’ with Palestinians that guarantees them the territories and their resources without having to govern the people. The Fayyad Plan, instead of challenging the occupation, seeks to integrate its policies and infrastructure into a future state. Fayyad’s effort to create normal economic life in the West Bank compliments the vision of the Israeli state. It is aimed at silencing Palestinians with employment in a setting of economic desperation (within joint Israel/PA industrial zones) and no real national self-determination. 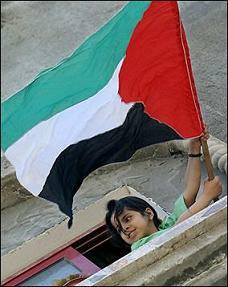 The Palestinian struggle for liberation, however, has never been an issue of simply statehood. The Palestinian struggle is an anti-colonial, anti-racist one seeking justice for an indigenous population that was ethnically cleansed from their land in 1948. In all these discussions about a state, the right of return of Palestinian refugees is sidelined. In PA documents, there is now only a referral to a ‘just solution,’ and not a ‘right of return.’ Any proposed state or entity for Palestinians that actually ignores the majority of the Palestinian population, namely the refugees, cannot be a basis for a just peace. This proposed state also does not address the discrimination that is faced by Palestinian citizens of Israel. Some will claim that demanding the right of return or equality for Palestinian citizens of Israel is utopian, and that Palestinians should accept whatever they are being offered because of the so-called ‘consensus of the international community.’ What fuels anti-colonial movements though is not an acceptance of what colonizers have to offer – rather a defiance to demand the seemingly impossible and to fight for it. While there is an attempt to narrow the Palestinian struggle to an issue of building state-institutions in the West Bank (while Gaza remains under a brutal siege), the Palestinian-led Boycott Divestment and Sanctions (BDS) movement speaks to the unity of the Palestinian nation. The BDS campaign demands rights for Palestinian refugees, those living under occupation in the WB and Gaza, and Palestinian citizens of Israel. We are witnessing the emergence of a Palestinian alternative to the failed paradigm of normalization and neoliberal development that has come to animate the PA. It will take some time for this new vision to crystallize, especially when the traditional Palestinian left is at its weakest point historically and seemingly more invested in being the go-between for Hamas and Fatah than in being an alternative voice in the Palestinian political arena. However, slowly but surely, new political formations are emerging calling for a return to the basic tenets of the Palestinian struggle for self-determination. The normalization process embedded in the Fayyad Plan stand in stark contrast to the growing BDS movement. On the one hand, Palestinian grassroots movements are asking the world to boycott Israel until it complies with international law. On the other, Fayyad promotes the normalization of relations with Israel. It is important to stress here that the BDS campaign did not come out of thin air – there is a strong history of anti-normalization activity within Palestinian society. The BDS campaign is not ‘leaderless’ – it has a basis and structures within the Occupied Territories in the Boycott National Committee (BNC). It is certainly a young movement attempting to build some coherence within Palestinian ranks after the utter confusion of the so-called Oslo peace process. It must be supported, not simply from a solidarity framework, but as part of the global struggle against neoliberal hegemony. The Fayyad Plan for ‘economic development’ currently faces the same problem Israel has faced for years: the Palestinian people. No matter how hard the Palestinian Authority has tried, it is difficult to sell Palestinians this idea of a truncated state. It is easy for Palestinians living in the West Bank to understand, just from looking out their windows, that Israel is creating facts on the ground that make a Palestinian state in the 1967 borders impossible. Rafeef Ziadah is a founding member of the Coalition Against Israeli Apartheid (CAIA) in Toronto and an organizer of Israeli Apartheid Week. Her latest CD, “Hadeel,” can be heard and purchased at www.rafeefziadah.ca. 4. In the article “Netanyahu: Economics, not politics, is the key to peace” Raphael Ahren. Haaretz Nov 21, 2008. 5. World Bank Report: A Palestinian State in Two Years: Institutions for Economic Revival Economic Monitoring Report to the Ad Hoc Liaison Committee. September 22, 2009. p.15. 6. For a good overview on this and other joint PA/Israel initiatives see Stop the Wall, “Development or normalization? A critique of West Bank development approaches and projects” at www.stopthewall.org. 8. Lieutenant General Keith Dayton, Michael Stein Address on U.S. Middle East Policy, Program of the SOREF Symposium, Washington Institute for Near East Policy, 7 May 2009.